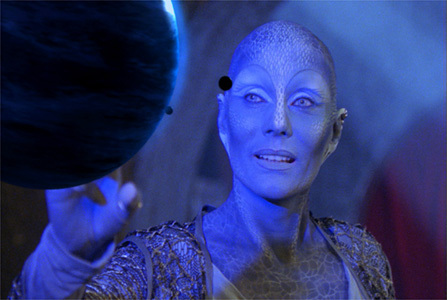 Virginia Hey portrays Pa'u Zotoh Zhaan, a Delvian Priestess who possesses mystical powers, in the SCI FI original series, Farscape. One of Australia's most successful actresses, Hey has appeared in the American series Roar, Flipper, Mission Impossible, and Dolphin Cove; Flesh and Blood for Channel 4 in the UK; the popular series E Street for Westside Productions; and Pacific Drive in Australia. Hey made her film debut as the Warrior Woman in George Miller's Mad Max 2: Road Warrior starring Mel Gibson. She also starred in the James Bond film The Living Daylights; Castaway, directed by Nicholas Roeg; Mussolini; Return of Captain Invincible; Norman Loves Rose; and most recently Signal One. Her television movie roles include Crazy Like A Fox for USA Network; Big Deal for BBC television; Timeslip for HBO; Vietnam directed by John Duigan; Home and Away; and Neighbors and Prisoner for Grundy Television. Visit her official website at www.virginia-hey.com. This page has been visited times since August 7, 2000.